We are pleased to present the results from the very first Tradie Confidence Index (TCI) survey. You can find the raw data on the Tradie Index website, and as founding supporters of the index, we have put together our own analysis which you can read below. The survey seeks to measure the level of business confidence amongst self-employed tradies working in the building industry in Australia. Whilst there are already indices which track overall business confidence, as well as building approvals and building starts, there remains a gap. Many tradies don’t necessarily work on new builds. They are undertaking maintenance work, installations and renovations. The survey seeks to gauge how self-employed tradies are feeling overall. Not just those who work on new builds. The survey clearly showed that tradies working in NSW are the most upbeat when it comes to their current position, as well as looking forward over the coming 12 months. They also felt the most positive about the overall outlook for tradies and the broader economy over the coming 12 months. Victorian tradies seemed quite positive about how they were travelling right now, but not so confident when looking ahead. The full results are detailed below. Q1. Would you say you have more work or less work on now compared with the same time last year? Overall we found that most tradies are enjoying more work right now that they were at the same time last year. Nationally, 73% of tradies felt they had more work, leaving 27% who felt they had less work. In NSW this feeling was the strongest, with an overwhelming 88% of tradies responding positively. This leaves only 12% who thought they had less work now compared with last year. This has to be considered a very strong result for NSW. Queensland had the lowest score of the eastern states, with just 64% responding positively. Q2. 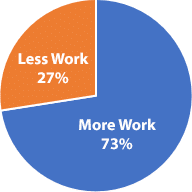 This time next year, would you expect to have more work or less work on than you do now? Tradies appear to be even more positive about the level of work they’ll have this time next year. Whilst 73% of tradies felt they had more work now compared with same time last year, this increases to 76% when thinking about how much work they’ll have this time next year. NSW was again the most positive state, with 80% of respondents expecting more work next year. Queensland tradies again had the lowest rating, with 72% expecting more work at this time next year. This is still a positive result, and shows they are more positive about next year than this year. Q3. Do you think over the next 12 months tradies overall will be experiencing good times or bad times? Despite most tradies expecting to have more work over the next twelve months, they don’t appear to be so confident about the outlook for tradies in general. Only 67% of respondents were expecting good times for tradies overall. That a leaves a third of all tradies expecting bad times over the next 12 months. NSW was relatively strong with 76% having a positive outlook. Respondents from outside NSW, Victoria and Queensland were most negative their outlook, with just 56% responding positively. Q4. Thinking about the overall Australian economy, are you expecting good times or bad times over the next five years? Tradies don’t appear to have a lot of confidence in the overall economy over the next twelve months, with only just over half expecting good times. 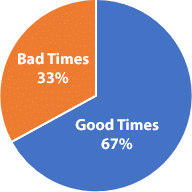 Only 56% of respondents nationally were expecting good times in the overall economy over the next twelve months. 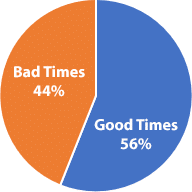 Victorian tradies were the most negative, with just 48% expecting good times and more than half expecting bad times. This was the only question that resulted in more than half of a single state giving a negative answer. Q5. Do you think the next 12 months will be a good time or a bad time to invest in your business? Be it equipment, staff or otherwise. Confidence plays a huge part in investment decisions for any business, and right now it appears tradies aren’t feeling it. Only 66% of tradies felt that it would be wise to invest in their business over the next twelve months. NSW and Queensland respondents had the most positive outlook, with 72% in both states believing it would be a good time to invest. Victoria had the lowest score, with just 56% of tradies keen to invest over the coming year. As with any index of this type, the real benefit comes from seeing the trend in responses over time, rather than looking at one period in isolation. Despite that, there is plenty we can take away from these results. Firstly, it is quite clear that NSW has the most positive tradies in Australia in terms of how they’re feeling right now, and what they’re expecting next year. Victorian tradies appear to be fairly happy with the amount of work they have now and over the coming year, but don’t seem so confident overall looking ahead. Overall every question had a positive result, and when we break it down into the states we only have one negative, which was how Victorian tradies felt about the overall economy over the coming twelve months. Attention now shifts to collecting survey responses from the next quarter, which runs from October to December 2017. To participate in the current survey please click here. Would you say you have more work or less work on now compared with the same time last year? This time next year, would you expect to have more work or less work on than you do now? Do you think over the next 12 months tradies overall will be experiencing good times or bad times? Thinking about the overall Australian economy, are you expecting good times or bad times over the next five years? Do you think the next 12 months will be a good time or a bad time to invest in your business? Be it equipment, staff or otherwise. There were just under 100 responses for the quarter, which isn’t a huge number, but we do expect it to increase each quarter as the index becomes more widely known. To participate in the survey please click here. For any media enquiries please contact us.